Everyone has a few standby meals that are easy, tasty, and use the ingredients you generally have on hand at any given time. This is one of ours. It’s not pretty or fancy, but it’s tasty, comforting and dependable. Before I get into the recipe, I want to talk ingredients. The downfall to this recipe is that it depends on a specific brand of vegan sour cream, and some people prefer to stay away from such specialty products for health or monetary reasons. I’ve tried this recipe with homemade tofu sour cream, and there really is no comparison. I can vouch for Tofutti’s Sour Cream. If you decide to make it with something else, you’re on your own. I use seitan in this recipe alongside the mushrooms. Like many vegan products, things vary drastically from brand to brand. Not all seitan is created equal. My favorite was White Wave’s seitan that came in a blue cardboard box, but I can’t seem to find it anymore. All the stores near me have switched to their “Chicken Style” seitan in tofu tub, and I find it too dry and tough. You can definitely use it in this recipe, but a I prefer a softer, moister seitan like the orignal blue box or The Bridge seitan pictured here. If you make your own seitan, by all means use that! A quick note about mushrooms, then I’ll make with the recipe. You can use whatever mushrooms you like, but I find the little packages of white buttons or creminis to work the best. 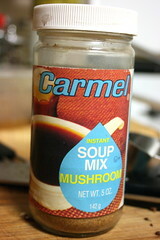 I also dial up the mushroom flavor with a bit of dried mushroom soup base. The brand pictured here is vegan, but full of things you may not like, such as MSG and partially hydrogenated stuff. Since I use it so infrequently, and when I do use it it’s only a teaspoon or so, I’m not really bothered by it. If it bothers you, feel free to sub soy sauce, plain salt, or anything else that will give a small salty kick. I’m happy with my powdered stuff that lasts forever and is dirt is cheap. Click the link below for the recipe! Start a large pot of water for your pasta and then start following these directions.Â The timing should work out so that the pasta is ready when the sauce is ready, but if it finishes early, simply drain the pasta and toss it with some olive oil to prevent sticking.Â Set aside until you’re ready for it.Â If your sauce is finished early, just cover it and keep it warm until the pasta is done. Heat olive oil in a large skillet over medium-low heat. Add onions and sautee slowly until caramelized, about 10 minutes. While onions are cooking, chop your garlic, mushrooms, and seitan. The mushrooms and the seitan should be chopped to about the same size, that is, in thin strips. Keep mushrooms and seitan separate, since you’ll be adding them to the pan at different times. When the onions are nicely caramelized, add garlic and saute for 1 minute until fragrant. Add mushrooms and 1/2 Tbs Earth Balance. Turn up heat to medium-high and saute until cooked down and soft. Add wine to deglaze the pan, if you have some, and cook until the liquid has evaporated. Add seitan to pan. 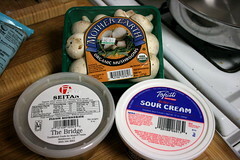 Add the entire tub of sour cream, the mushrooms stock, and the tamari and stir well. Add the pasta to the skillet to coat with your stroganoff sauce. If the sauce is too thick, add some of the reserved seitan broth to thin it – water or veg stock will also work. Add peas and cook briefly until thawed. Plate, and top with fresh black pepper. I also used some smoked paprika for color. Mmm…this sounds so good. I made some seitan yesterday and it turned out really yummy. So now I just need to get some mushrooms and sour cream! Tofutti sour cream is delicious! I just bought a box of the White Wave Seitan at my Whole Foods (newtonville). It was even on sale (2.49!). You know, I can’t stand the idea of stronganoff, *but* yours actually looks tasty. I made this for dinner tonight and loved it. This was my first time cooking with seitan and I’m so glad I did. I just reheated some for a late night snack – it doesn’t look very pretty reheated but still tastes great. yum! I made this last night for dinner and it is my new favorite comfort food. Thanks for the recipe! Wonderful meal, made tonight with the seitan recipe from PPK. Thanks so much for sharing! This looks great! 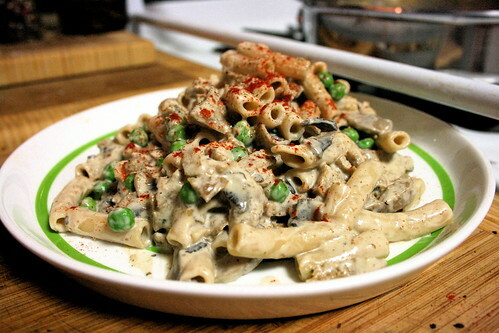 I have tried seitan stroganoff before and while good, I needed to find something else. I like that this has few ingredients (my grandmother always told me the less ingredients, the better it will likely taste. I found this to be true on more than one occasion) . Also, I am not sure where you live, but my local Whole Foods and also Wild Oats (which got bought out by Whole Foods, boo!) carry the blue box seitan. It runs about $2.50 still. I made this recipe tonight, I added shiitake & portabello mushrooms, the seitan is homemade and I added soygurt instead of the sour cream, no wine and it is truly a feast to the palate! Serving it over ww fettuccine, with steamed broccoli, cucumber salad with a olive oil/white balsamic vinegar dressing. My non-vegan boyfriend gobbled it up too!! Great “Stroganoff”!! I have tried making other vegetarian versions of this before and none quite came out tasting awesome. THIS recipe however is totally delish! My boyfriend who is not a veggie came home and saw me cooking it and was like EW – what is that stuff? “Seitan babe! You’re gonna like it.” He LOVED the whole recipe. He even packed leftovers for lunch today. A definite hit. Thanks for the great recipe!! Excellent recipe! Although my partner and I have always been real “meat and potatoes” guys, we’ve decided to become vegan. This is the first vegan recipe I’ve tried and I have to give it a MAJOR TWO THUMBS UP!!!! Thanks so much for a great recipe. I know I’ll make it again and again. How much would this suffer if you left our mushrooms? If the flavor is important could you sub canned mushroom soup or something?